BANDUNG - PT Summarecon Agung Tbk through its business unit Summarecon Bandung (PT Mahkota Permata Perdana) has officially established cooperation with West Java Provincial Government (Pemprov Jabar) to build infrastructure in East Bandung area. The cooperation form is the development of infrastructure conducted by Summarecon Bandung on land owned by the West Java provincial area of approximately 48.912 m2. President Director of Sumarecon Adrianto P. Adhi explained that the entire road construction is part of a large constellation of Bandung Raya toll road network, which includes the construction of a toll flyover, which is part of Bandung Intra Urban Toll Road (BIUTR). "Infrastructure in the form of a road that has planned since 2015 by Summarecon and West Java Provincial Government can be implemented immediately," said Adrianto P. Adhi as reported from jabarprov.go.id (11/1/2018). The inauguration of the cooperation agreement was carried out with the cooperation signing between West Java Governor Ahmad Heryawan and President Director of Summarecon, Adrianto P. Adhi in state building Pakuan Bandung, Wednesday (10/1/2018). 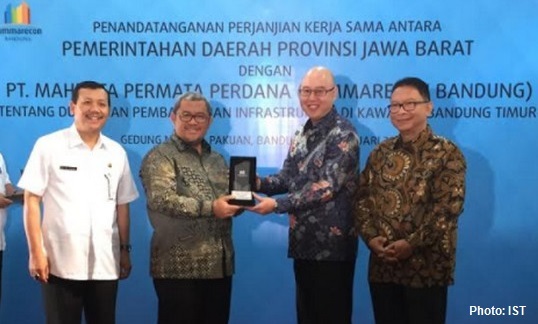 The Governor of West Java, Ahmad Heryawan (Aher) assess the development of this infrastructure is very helpful and beneficial to all communities. The governor said after the project is completed, the road will be donated to Pemprov Jabar then will be granted to the central government.